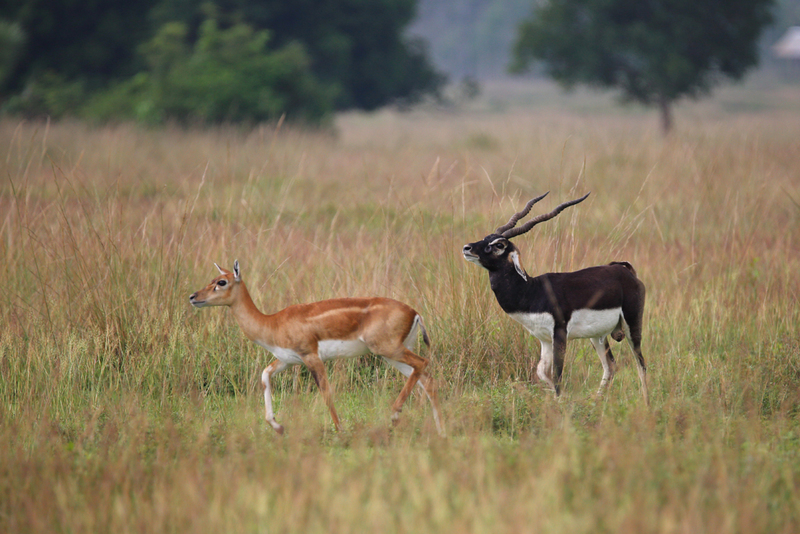 Home to a herd of 400 Blackbuck, visit Vetnai, the less-frequented traveller’s haven for photography. I had heard about “Vetnai” from the manager of Godwitt Eco Cottage at Mangolajodi. It’s a small village in Ganjam district in Orissa (near ‘Aska’ or ‘Asika’ town). When asked about the speciality of that place, he informed me that Vetnai is a natural habitat of Blackbuck. I was surprised to hear this since Blackbuck is not common in the eastern parts of India. The species is mainly found in northern, central and southern India (from Rajasthan in the west to Punjab in the north, down to Tamil Nadu in the south). Although aware that some Blackbuck is found in Orissa, I didn’t know that it is Vetnai which is a natural habitat of the particular species. The manager also informed me that like Mangolajodi, Vetnai also is not a protected forest zone. The knowledge of such a place within driving distance of a few hours excited me and without any hesitation, I decided to visit the village. Starting early in the morning, I reached Vetnai after a 2-hour drive. A young local man was waiting for me. He introduced himself as a member of the Blackbuck protection group of Vetnai. According to his advice, I left my car at the village ‘chauraha’ and followed him through the narrow village alley. On our way, he had told me a wonderful folktale about the Blackbucks of Vetnai. According to the legend, a long time ago (100 or 150 years), Vetnai and its adjacent area were suffering from extreme drought which caused famine in the area. The villagers started to evacuate the place in search of livelihood. At this point in the tale, a herd of Blackbucks arrived in the village and the next day brought torrential rain to the village after many months. The incident created a belief in the villagers that those animals were descendants of God. Since then the Blackbuck of Vetnai is worshipped as the symbol of prosperity of the area and protected from all harmful activities. I don’t know whether any realistic evidence lies behind that tale. But, the myth has been playing its part to protect these beautiful animals for years. 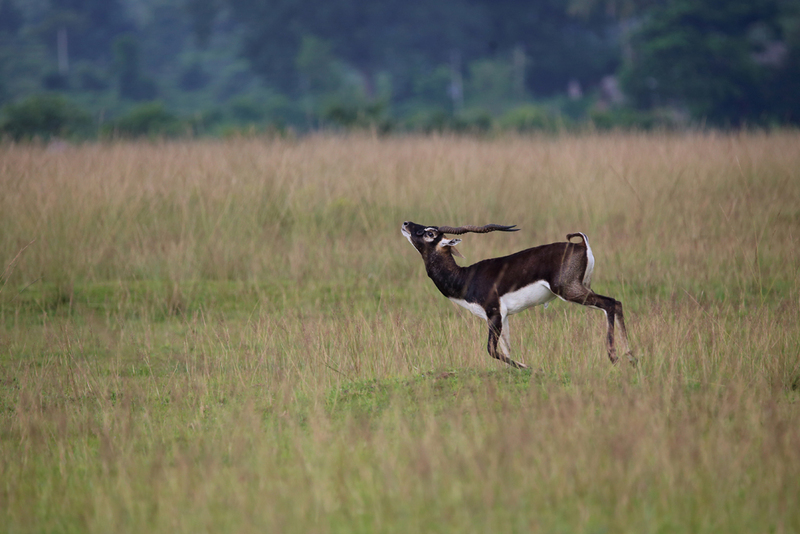 My guide informed me that approximately 400 Blackbuck were present in the area; among them, nearly 120 were male deer. In winter mornings, they gather in the crop fields at the eastern hillside of the village. I had noticed the vast expanse of the field while crossing the village. A major part of the field is used for the cultivation of paddy and has been transferred into a plain land for this purpose. But, original characteristics of the land can be seen at the eastern side of the field where after approximately 300 metres, the land starts to ascend gradually by steps and consequently meets with the dark greenish-blue range of Eastern-ghats. Standing on the verge of the paddy-field my guide pointed towards the far eastern corner of the ground. Following his finger, I saw a herd of Blackbuck grazing in the field. Unfortunately, they were out of the range of my camera lens. We discovered that we could not move straight towards them as there was vast open space between us. So, we started walking towards the north, using the bushes and rows of palm trees as our natural cover. After a long walk, first towards the north and then eastwards, we reached a spot where I found the herd within the reach of my photographic gears and took a few shots. Then my guide pointed to another small bush, a few yards away from of us. Rationalising that I might get a better shot if I reach that position, we crossed the distance to the bush without any natural cover. It proved to be a wrong decision since as soon as we left the cover the herd became alert. The alpha male stopped grazing and stood still, watching us carefully. Realising that herd would not give me the second chance, I started clicking my camera. The sharp sound of high shutter speed made the herd aware of my presence and they started running towards the mountain. In a few seconds, they vanished at the far corners, behind the isolated bushes. It was a wonderful sight to behold, watching them running with unspeakable rapidity and agility. I checked my shots and felt relieved as I found a few presentable shots in my collection within that brief period of time. Love the 3rd photograph…it’s really refreshing to read the article…as if am reading short story about the small hamlet ventai and it’s hero blackbuck..good job Arnob and all the very best. Went through your article. A very thorough and well written documentation. Kudos to you Arnab. Wonderful. I have forwarded this article to other nature lovers who will surly visit Ventai soon. Thanks Arnab. Thanks Arnab for sharing the article. Clarity of yours photographs are as usual wonderful. Me also interested to visit Ventai. Very informative article and beautiful pictures. A place I would like to visit.